With Sriracha being one of the hot sauces that caught our fancy lately, it made sense to try brewing some with our garden vegetables. Finding clear directions and written encouragement from Sean Timberlake (here) sealed the deal. 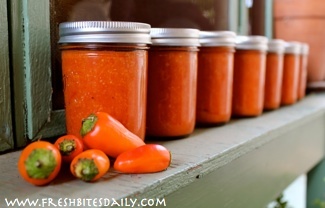 Of the several renditions of hot sauce from this summer’s canning adventures, this is the stand-out, our favorite. I wanted a bright color as well as bright flavor so I used red and orange Santa Fe peppers. They have heat, but not too much fire if you remove the seeds and membranes. Other than the fact that the peppers sit overnight in vinegar, the whole process was amazingly quick. If I had any idea how easy Sriracha was, I would have made it much sooner. Mix up a batch of this beautiful stuff and you will find loads of ways to enjoy it. Mix with mayonnaise for a sandwich. Splash it into eggs before scrambling. Add it to any dip for some zing. Use it as seasoning for beans or grains. Use a squirt to enliven your salad dressings. The bottom line: I’ll be making much more Sriracha next season and so will you once you get on this track. NOTE: Use caution in handling the peppers. Even the mildest ones can burn your eyes. You may want to wear latex gloves when removing the seeds and membranes. To help neutralize the heat on your hands after doing this job, rinse your hands well and rub fresh lemon juice into your fingers and under your finger nails. Rinse again. Still be cautious. Do not rub your eyes for a while! Wash the peppers and spread them out to dry. Cut off the pepper tops and discard. Slice the peppers in half. Remove and discard the seeds and membranes. Peel and mince the garlic cloves. Pour the vinegar, sugar and salt into a non-reactive container. I used a glass gallon jar for this. Mix until the sugar and salt have dissolved into the vinegar. Add the peppers and garlic to the vinegar mix. Cover and refrigerate overnight. This next day strain the garlic and chilis from the vinegar. Strain the vinegar into a large saucepan. Cook the vinegar until it is reduced by half. Add the strained peppers and garlic to the reduced vinegar and continue cooking until the peppers and garlic are completely soft, cooked through. Blend the cooked sauce in a food processor. Careful! This sauce is hot in more ways than one. 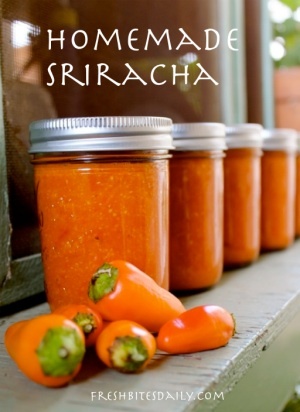 Return the blended Sriracha to the sauce pan and keep it at a low simmer while canning it. The canning situation should be set up and ready when the sauce is ready. Follow the manufacturer’s directions that come with the canning jars. Turmeric milk (“golden milk”) for cold, flu, depression, and more!